Good tide movement this weekend, and with full moon on Monday this Sat/Sun should be lights-out fishing. The specked trout are in the rivers, but not quite as strong as normal this time of year. They're really spread thin. 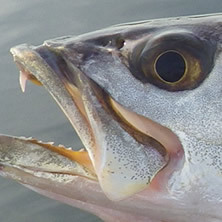 White trout are being caught in large number at the north pass area, where the Blakeley river dumps into the bay. The rivers Dog river, East/West Fowl river, and Bayou La Batre are all starting to ramp up with really good fish. They're still also at the mouths of these rivers out on the oyster flats.